Wuesthoff & Wuesthoff Patentanwälte PartG mbB is a partnership of patent attorneys registered at Amtsgericht München under number PR 1403. Authority acc. to Telemediengesetz (TMG): German Patent and Trademark Office / Bar Association for German Patent Attorneys, Munich; Institute of Professional Representatives at the European Patent Office, Munich; Bar Association of the Higher Regional Court of Munich. Further information on the respective professional regulations is shown here. The Patent Attorneys practising for WUESTHOFF & WUESTHOFF are members of the Patentanwaltskammer (German Chamber of Patent Attorneys), Tal 29, D-80331 Munich, Tel: 089-242278-0, Fax: 089-242278-334 (http://www.patentanwalt.de), and are entered in the List of Patent Attorneys of the German Patent and Trademark Office. The Patentanwaltsordnung (POA; German Patent Attorneys Code), the Berufsordnung für Patentanwälte (BOPA; Professional Code for Patent Attorneys), and the Code of Conduct of the Fédération Internationale des Conseils en Propriété Industrielle (FICPI) are applicable to them. These can be found here, and here. The European Patent Attorneys practising for WUESTHOFF & WUESTHOFF are members of the Institute of Professional Representatives before the European Patent Office (www.patentepi.com), and are registered with the European Patent Office. The codes of professional conduct of these institutions as well as the Regulations on discipline issued by the epi Council are applicable to them. These can be found here. 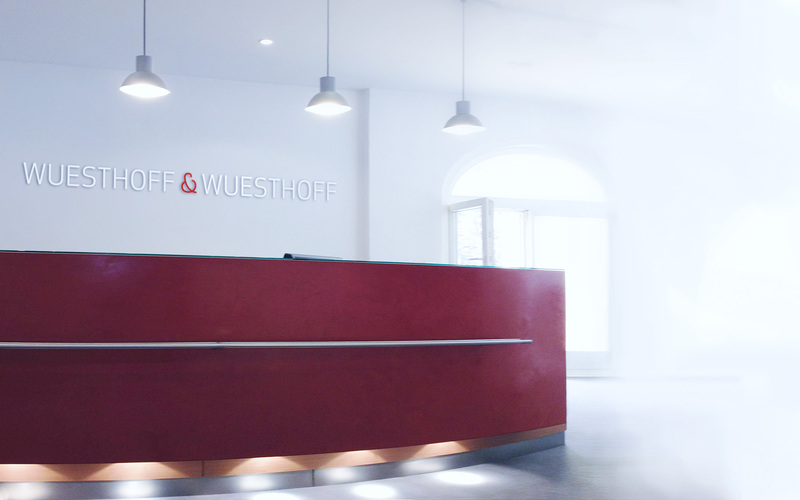 The attorneys practising for WUESTHOFF & WUESTHOFF are registered with the European Union Intellectual Property Office. The provisions of the Council Regulation on the Community trademark, which can found here and the Council Regulation on the Community design, which can be found here, are applicable to them. The lawyers practising for WUESTHOFF & WUESTHOFF are members of the Rechtsanwaltskammer (German Chamber of Lawyers) for the judicial district of the regional court of Munich, Tal 33, D-80331 Munich, Tel: 089-5329440, Fax: 089-53294428 (www.rechtsanwaltskammer-muenchen.de). The Bundesrechtsanwaltsordnung (BRAO; Rules and Regulations for the German Bar), the Berufsordnung der Rechtsanwälte (BORA; Federal Lawyers' Code of Conduct), the Rechtsanwaltsvergütungsgesetz (RVG; Attorney Remuneration Law), the Fachanwaltsordnung (FAO; Regulations for specialized lawyers), the professional rules and regulations for the lawyers of the European Community (CCBE) as well as the law on the activities of lawyers (EuRAG), which can be found here, are applicable to them. A professional liability insurance, which complies with the requirements of Art. 51 BRAO (Bundesrechtsanwaltsordnung = Rules and Regulations for the German Bar) and/or Art. 45 Par. 1 PAO (Patentanwaltsordnung = German Patent Attorney Code), exists for the partners and the members of the staff of our law firmwith AXA Versicherungs AG, Wiener Platz, D-51065 Cologne, Germany. The geographical scope of the insurance coverage extends to activities performed in the member states of the European Union. The completeness, accuracy and timeliness of the information on this website is not guaranteed. No liability is assumed. All items and content on this site, such as graphics, images, photographs and texts, are copyrighted. The reproduction or use of the here displayed objects and contents in other electronic or printed publications is not permitted without our prior express consent.